Hampton Court Palace is a real must-see when you are visiting the London area, along with the Tower of London, Hever Castle and attractions like the British Library and National Portrait Gallery. Hampton Court Palace started off as a manor that was acquired as a grange by the Knights Hospitallers of St John Jerusalem in the 13th century. This religious order eventually rented out the property and land, and Cardinal Thomas Wolsey obtained it on a 99 year lease in 1514 and began transforming it from a private house into a huge palace complex fit for a king. Wolsey built the palace to impress the whole of Europe and it was a wonderful fusion of Catholic iconography and Renaissance art and architecture, with an incredible “long gallery” which made use of terracotta. The palace was so luxurious and “fit for a king” that when Cardinal Wolsey fell from grace in 1528, he lost both his properties at York Place and Hampton Court to Henry VIII. The Great Hall – a dining room just perfect for a king to entertain in. The Great House of Easement – a lavatory system which could seat 28 people at a Ltime! Lead pipes to carry water from Kingston’s Coombe Hill, 3 miles away, to the palace. Paintings – Henry VIII commissioned Renaissance artist Hans Holbein as his Royal painter. As well as entertaining, the palace also served as luxurious accommodation for the King and his wife (wives!) and was also the setting of key events – the birth of Edward VI (son of Jane Seymour and Henry VIII), the death of Jane Seymour, the house arrest of Catherine Howard and the marriage of Henry VIII and Catherine Parr. Catherine Howard – It is the ghost of Catherine Howard, Henry VIII’s fifth wife, which gives “The Haunted Gallery” its name. Apparently, when Catherine was charged with adultery in 1541 at the palace, she broke free from the guards and attempted to run into the chapel to find Henry. Unfortunately, Henry would not help his queen and Catherine was beheaded at the Tower of London for adultery and treason. It is said that she floats around the Haunted Gallery with a look of despair and making an awful shrieking sound! Jane Seymour – Jane is said to haunt Clock Court and is seen carrying a lighted taper. Sibell Penn, “the lady in grey” – Sibell was little Prince Edward’s nurse (Edward VI) who died in 1562 and was buried at Hampton Church. Her remains were disturbedin 1829 when the church was demolished and she now returns to the rooms she once knew so well at Hampton Court Palace. “The Wolsey Closet Dog” – Yes, a phantom dog can be found at Hampton Court Palace in the Wolsey Closet alcove. 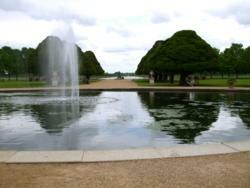 See “A Visit to Hampton Court Palace” page for a ghostly video! Monday to Sunday – 10am-4.30pm. For those of you desperate to have a Tudor themed wedding or party, why not hire out Hampton Court Palace?! See the website for details. Click here to watch a video of a visit to Hampton Court Palace. I heard, in the past, that Anne Boleyn never actually lived at Hampton Court. Is this true? If true, where did she live ?